Garlic isn't exactly the most social food. It tastes delicious and quickly upgrades an array of dishes, but get it on your breath before you're able to pop in a mint, and you could easily become the least popular guest at the dinner party. Smelly or not, though, it has immense health benefits that might make you consider incorporating it into your day-to-day diet (with a bottle of mouthwash on hand, of course). 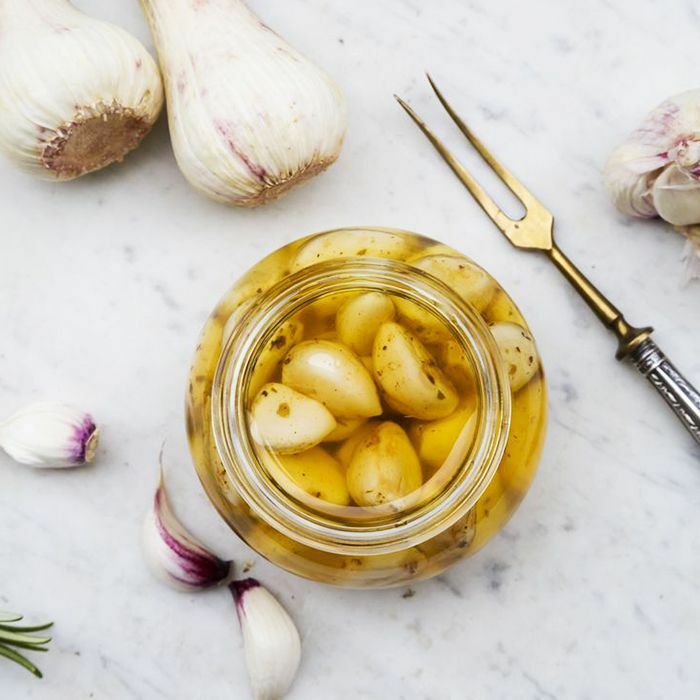 We spoke with some nutritionists and had them weigh in on the different health perks garlic has to offer, as well how to incorporate this pungent food into your diet that even the biggest skeptics can appreciate. Containing essential vitamins and a plethora of antioxidants, the root vegetable is your immune system's new best friend. Keep scrolling to read more about all of the magical benefits of garlic. According to Taylor Riggs, RD, LDN, the consumption of garlic aids in "supporting healthy blood pressure and cholesterol levels." It also helps protect against plaque buildup, which Riggs says stems from "the antioxidant allicin," or the sulfur compound garlic is made from. Certified nutritionist and personal trainer Robin Plotnik says that garlic "may also provide significant benefits to those suffering from diabetes." While the link between the sulfuric food item and diabetes is still heavily debated, according to Lindsay Surowitz, holistic nutritionist and founder of Weeknight Bite, "studies noted a reduction in blood sugar levels and insulin being more readily available in the body." While garlic won't protect you from Edward Cullen, Riggs states it is useful in preventing "certain types of cancer, including colon cancer, and might even help to ward off the common cold." Not only does it function as a protective agent and help maintain homeostasis, but it also "defends the body's cells against carcinogen activation, enhance detoxification, and help initiate apoptosis," according to Surowitz. Now that you may be reconsidering an aversion to garlic, you may be asking how to incorporate it into your diet without it warding off passersby. While garlic supplements help you avoid unpleasant breath, eating the actual food itself is the best way to make sure you receive all of the promised health benefits, says Surowitz. Plotnik suggests that if you don't particularly like the taste, add it strategically to some of your go-to dishes. "Chop two cloves up into small pieces and mix into your favorite guacamole recipe, use as a topping for mashed potatoes, stir into cooled pasta sauce, or blend into hot sauce." So just how much garlic can you eat? Riggs says that while there is no daily recommended intake for garlic at this time, the World Health Organization calls for four to five grams or one to two cloves per day. She even suggests letting it "sit out for at least five to ten minutes after mincing" to help the cloves release their beneficial compounds and to subsequently reap maximum health benefits. Next up, take a look at the world's most powerful superfruit.